Astrill VPN is a Seychelles-based VPN service launched in 2009. Apart from claiming to be number 1 in the VPN apps market for nearly a decade, Astrill VPN promises a whole lot in terms of performance, speed, privacy, and useful security features. In this Astrill VPN review, we put these claims to the test and discover just how good this VPN service actually is. Astrill VPN apps are not much to look at. With a plain background in shades of blue, a huge on and off button, and a look that’s a bit outdated, they are not too pleasing to the eye and it mostly seems like the creators have not put too much thought into the design. However, the utter simplicity contributes to the ease of use and all apps are now highly functional, which was not the case some years ago (the mobile apps have gone through some much-needed tweaking). You can easily switch the VPN on or off, select the desired server, choose which apps you want to protect, switch between protocols, UDP and TCP connections, and access all basic and advanced settings. Built with usability in mind, Astrill VPN may not wow you with its design, but it is perfectly easy to navigate, so you can get used to it right away. Astrill VPN claims to cover the entire world and that is pretty much the truth. It currently operates 330+ servers in nearly 50 world countries and the list of servers is constantly expanded. Its servers are located on 6 continents, with the majority of them in the US (nearly 150 servers). Apart from the usual locations like the UK, Switzerland, Singapore, and Hong Kong, it has chosen a couple of more exotic locations, including Malaysia, Indonesia, Bulgaria, Moldova, Egypt, and South Africa. The speeds are quite reliable and often above average and the performance is impeccable. Thanks to the large server network, you can easily find a server nearby and enjoy high speeds. If you want your VPN to be even faster, you can get the best speeds possible with the VIP add-on. For more good news, Astrill VPN offers WebRTC and DNS leak protection, along with unlimited bandwidth and server switching. Compatibility is one of Astrill VPN’s strong points. It offers apps for Windows, MacOS, Linux, Android, and iOS, it works on routers, and it even provides pre-configured VPN routers of its own. While dedicated apps are available, you can configure Astrill VPN manually with the help of its easy-to-understand manual. 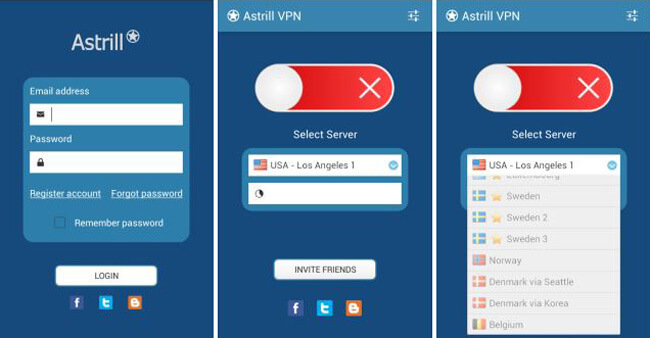 You can use Astrill VPN on all of your devices and the service allows as many as 5 simultaneous connections. What is important to know is that if you want to protect more than one device, you should purchase a subscription via the Astrill VPN website, as purchases made through e.g. Apple App Store allow you to use it on only one device. 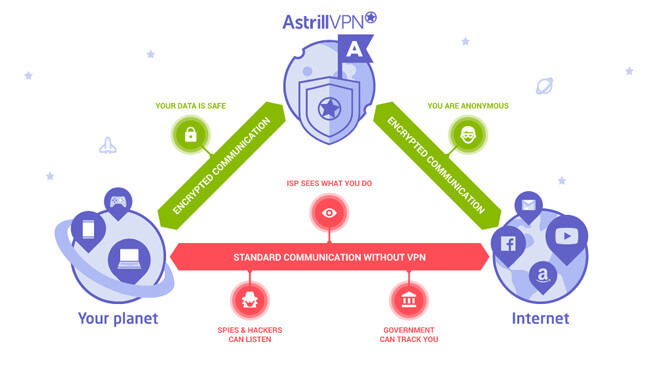 So far in this Astrill VPN review, we have mentioned that it has a rather large server network, offers excellent speeds and performance, boasts great compatibility, allows up to 5 concurrent connections per account, provides unlimited bandwidth and server switching, and protects you from WebRTC and DNS leaks. Now it is time to focus on the extra features it offers. First of all, Astrill VPN is P2P friendly, which is something torrent users are sure to appreciate. However, keep in mind that when torrenting, you should opt for either OpenVPN or StealthVPN and choose servers marked with a star. With AES 256-bit encryption and highly secure protocols including the safest OpenVPN and excellent proprietary OpenWeb and StealthVPN protocols, Astrill VPN offers maximum security to its users. No activity logs and Bitcoin payments guarantee an extremely high level of anonymity. Thanks to the Site And App Filter, you can easily choose which sites and apps go through the VPN connection and which of them you want to access using your real IP. 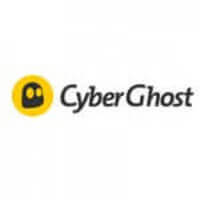 The service further offers App Guard, a kind of VPN kill switch, which allows you to block Internet access for apps of your choice when your VPN connection is suddenly terminated. The smart tunneling mode is another useful feature that lets you tunnel international sites through your VPN and access local sites with your real IP. Finally, with VPN Sharing, you can share your VPN connection from your Windows, Mac or Linux devices with other devices like smartphones and game consoles without any extra hardware or router. While Astrill VPN generally uses shared IPs, you can purchase a dedicated IP if you need one. Furthermore, you can get the VIP add-on that provides even better speeds and allows you to enjoy greater privacy with Multi-Hop connections. 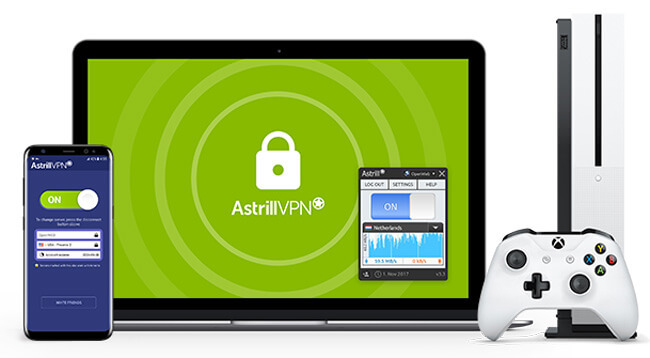 Astrill VPN uses AES 256-bit encryption and allows you to choose from a range of encryption protocols, including OpenWeb, OpenVPN, StealthVPN/RouterPRO, and Cisco IPSec. OpenVPN and StealthVPN are the preferred options since they provide maximized security. StealthVPN provides a dual layer of encryption, making it virtually undetectable, which is particularly important for users with strict Internet censorship like China. Being based in The Republic of Seychelles, Astrill VPN is not required by law to keep any logs. It does not collect or store any personally identifiable information or monitor your online activity. It only keeps track of active sessions in order to limit the number of simultaneous connections, but this information is erased as soon as the VPN connection is terminated. In addition to this high level of anonymity, the service allows you to pay with Bitcoin, so you do not have to share any personal information at any point. As we found out while researching for this Astrill VPN review, this is one of the rare VPN services that truly do a great job when it comes to customer support. You can get in touch with the support staff via a 24/7 live chat, contact form, email, and phone. US and Hong Kong phone numbers are available, but Chinese users should bear in mind that the operators only speak English. In the Support section of the website, you can find information about all the ways to get in touch with the support staff, along with an extensive FAQ, setup manuals, and helpful video tutorials. You can choose between Personal and Business subscriptions. If you opt for the Personal plan, you can get Astrill VPN protection for $15.90 per month with the monthly subscription, $11.65 per month with the semi-annual subscription, and $8.33 per month with the annual subscription. The service offers a 7-day free trial, but it is not available to Chinese users. The Business plan comes in the form of a yearly subscription and the price depends on the number of accounts you need. It ranges from $5.25 per account per month for 10 accounts to $4.62 per account per month for 200 accounts. If you want to enjoy optimized speeds and reduced latency along with Multi-Hop VPN for maximized anonymity, you can purchase the VIP add-on, which costs an additional $10 per month. Dedicated, static IPs on select servers are also available and come at the price of $5 per month per address. The prices of Astrill VPN routers start at $50. Accepted payment methods include debit and credit cards, including Visa, MasterCard, Maestro, American Express, Cirrus, UnionPay, JCB, and Diners, as well as bank wire transfer, PayPal, Perfect Money, Wechat Pay, AliPay, and Bitcoin. As we wrap up this Astrill VPN review, here’s a quick overview of the features that wowed us and the aspects of the service that could use some improvement. Our ratings are the result of an objective and independent evaluation of Astrill VPN, generating the final rating that reflects the overall quality of the company. Ratings may change as the service changes. Astrill VPN user rating based on 5 user reviews. Did you by chance use NETFLIX through Astrill (while in China)? If so, how did NETFLIX streaming go? The VIP add-on is ridiculously expensive, but if you want to download everything you ever wanted in a month, it’s worth it. Really good VPN overall and the guys I spoke to via live chat actually know what they’re talking about, so that’s a big plus. We found 0 verified Astrill VPN discounts for April, 2019. There are no Astrill VPN coupons or discounts right now. Discover the full range of possibilities Astrill VPN offers and become an advanced user in no time with our beginner-friendly Astrill VPN guides. Whether you are interested in secure torrenting, unblocking Netflix, setting up Astrill VPN on all your devices or you simply want to learn more about Astrill VPN, you can find verified information and clear instructions in our Astrill VPN guides below.